Landscaping in a particular area gives you more than a pleasant sight as it also relieves stress. A simple house with a beautiful landscape looks elegant. You don’t need a professional gardener or a massive budget to achieve a beautiful landscape. You can make your beautiful backyard without spending too much. The space and topography for landscaping should be considered first. It’ll give you a hint of how many and what type of plants to select, arrange and grow in your backyard. It will also serve as a basis for your layout. When you have a small yard, you can include flowering plants or potted plants in your layout to optimize the space. If you have a wide yard, you can plant large fruit-bearing trees. If you have trees and you need to decorate it, use scaffolding. Check this link for cheap scaffolding. Aside from visualizing how your yard would look beforehand, making a layout will save you a lot of time, effort and money at the end of the day. Planning and putting everything you have in mind on a piece of paper can create a good outcome. It helps you determine the available plants in your area and the kind of plants that best grow in your target site. Moreover, you’ll know what tools to buy instead of buying every tool. Bottles whether plastic or glass could save you from pot needs. Today, a lot of home-gardeners create a sophisticated arrangement of containers blending well with the plants. 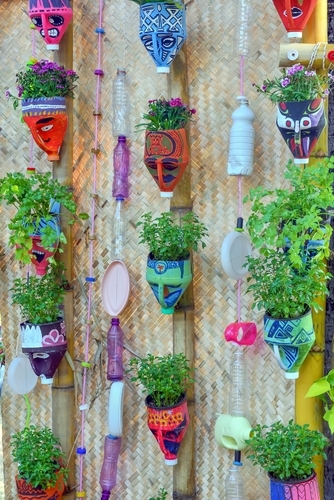 For instance, big plastic bottles can be carefully cut into an artistic feature and could serve as pots for small plants or those with shallow roots. Aside from keeping you a lot from spending, you are helping the environment, too. Since landscaping is intended for a long-term plant arrangement, shrubs or perennials are ideal for it. Some plants look good for just a few months and eventually wither and die. Some plants need to be watered most of the time and require the right amount of fertilizers to grow well. To save energy, time and even money, choose plants that can live for more than a year while growing beautifully as they age. When you have perennials, you can save so much from buying plants again and again. If you’re a homeowner, you can create a beautiful sight right in the backyard without following all the conventional and expensive landscaping models. Your creativity, determination, and action are the best capital for a low-cost yet elegant landscape. Remember that the key to successful landscaping is utilizing most of the available resources with careful planning with the right implementation. As long as you’re happy and satisfied with the outcome, nobody can question the quality of your landscape.